Inspired by Tom Tyson & Soundminded, I found 901's for $150.00. This included equalizer and stands. Maybe one of you guys can give me a quick step-by-step on how to hook them up. I have an Odyssey Startos amp (150 wpc) and an Adcom gfp555 preamp which easily drives my AR3as. The cabinets are just ok. Could use a re-veneering. I didn't check the surrounds but I believe the seller is the original owner and he just didn't strike me as the tinkering type. He did attach them to his amp just to let me listen for a few minutes. However, he didn't hook up the equalizer. Any guidance,tips or info will really be appreciated. Well, here goes a new adventure. Thanks guys!!! The requirements for these speakers to work as intended are easy to understand but they are a little different than other speakers. BTW, the speaker with the torn front grillcloth is the left speaker. The front drivers are intended to go to the outside extreme not the inside so you have them backward in the photo. The difference will not be profound though. The three important things are, connect them in phase with each other, connect the equalizer, and placement. First a little background since many people don't know what this is. Each enclosure has 9 full range drivers, 8 on the rear angled panels, one on the front. 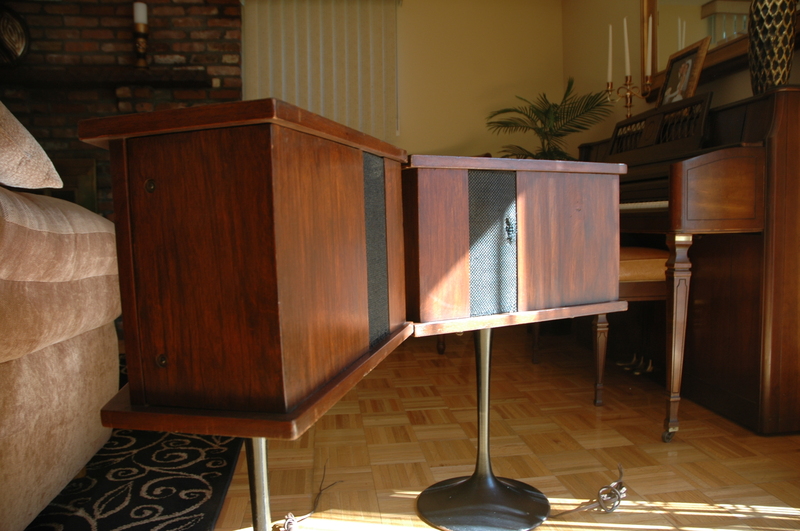 The complete system consists of the two speaker cabinets and the equalizer. The equalizer must be used with the speakers or they won't operate properly. This equalizer cannot be used with any other speakers or you may damage them since they provide up to 18 db of boost at 30 hz, more than most preamp bass controls at their extreme. Series I and II equalizers are interchangable and will perform identically at their indicated flat settings. The series II has more available treble boost settings, the original more treble cut settings. To check the phase, the easiest way is to place the speakers several feet apart, face the backs towards each other, play a monophonic recording or set your preamp for mono and sit between them. You should hear the sound come from one point inside your head just like with headphones. If you don't, shut everything off, reverse the connections to one speaker only and try again. This should put them in phase. The equalizer can be connected between the preamp output and power amplifier input or in the tape monitor loop of the preamp. If you use the tape monitor loop, connect the tape output to the equalizer main input and the equalizer main output to the tape monitor input and switch the preamp to "monitor." To verify that the equalizer is in the circuit, with music playing turn the power switch to the equalizer off and the sound should disappear. Also turning the equalizer's own monitor switch to monitor should do the same. Positioning the speakers is critical. The idea is to bounce the sound from the rear of the speakers against the wall behind them so that the reflections can develop and reach you from many angles. To do this you need to place the speakers from 6 to 24 inches from the wall behind them. 12 to 18 is usually the optimal range, I've found 15 works well in my room but you should experiment. You can toe the speakers in or out too to change the angles of bounce. You will want the speakers several feet from the side walls so that you will get a bounce off of them too. Poor positioning may be the single most common reason people who install these speakers are not satisfied with them. The idea is to create a broad spacious sound which does not seem to come from the speakers themselves but from a space behind them across the entire width of the room. Not all rooms are suitable for these speakers so try to choose a spot that will accomodate them. Lots of furniture or heavy drapes which will block or absorb the sound and prevent the indirect field from developing properly can also be a problem. I also have the pedistals and they are a good idea. They obviously cannot be mounted on bookshelves the way an AR3a can. The Original and Series II drivers supplied by CTS had cloth surrounds which usually do not deteriorate. I inspected mine several years ago and they seemed like new. But it also seemed to me that the putty used to seal between the drivers and the wood cabinet had cured and hardened. Like all acoustic suspension speakers, Bose 901 series I and II must be air tight for their bass response to be correct. I sealed around the rims and screw heads of mine with clear GE silicone caulking and they seem to work fine. I was careful not to get any on the cones or surrounds. I'd also use a flashlight to be certain that the driver behind the torn grillcloth is not damaged. I'd never seen a pair with this particular basketweave grillcloth before, I'm only dimly aware that it was ever offered. The sides and front are the optional walnut trim which were installed by removing the original grill cloth and are held in place by double sided tape. You can remove them without damaging them if you are very careful but you need to remove the sides I think before the front. The rear grillcloth is held in by staples. Let us know how this works out for you and what you think of them. Good luck. this been an older post, I may be out of place reviving. Then again I only signed up cause soundminded answer is very helpful. Anyways thanks, got some good gouge out of your reply post.